Urban Rivers is a nonprofit organization based in Chicago and dedicated to improving water quality in the area and teaching the surrounding community about sustainability. In 2017 the group developed floating gardens on the Chicago river they call 'river-ponics' and hope that creating these systems will attract wildlife and eventually yield economic benefits for the area. The group is currently crowdfunding their new project, a Trash Robot that will roam the area surrounding their floating gardens and keep the waters clean. The Trash Robot will be controlled by any users watching from the group's website, using classic ASWD controls in a first person view environment. There's no technical detail in the campaign video beyond a mock up showing some pool flotation devices on a remote control floating vehicle, and a mesh net in the front of the robot that will collect the trash. After collection the robot can be driven to a zone where Urban Rivers volunteers will remove the trash from the robot for disposal and send it back into the water. This project has several innovations worth noting, beyond the general sustainability and robotics angles. Allowing users to control the robot and giving a first person shooter view and what I'm assuming will be a Twitch Plays system is a great approach. 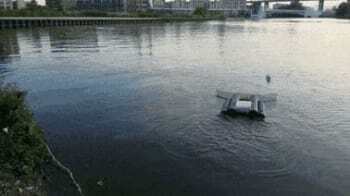 Groups of people can move the robot to collect trash and keep the area surrounding the floating gardens clean. This concept feels like a citizen scientist initiative with some gamification added in to attract as many users as possible. The campaign video says that the project will have a commitment to open sourcing both the programming and the hardware, and introduces the wide range of engineering and programming talent on the Urban Rivers Trash Robot team. The campaign ends on March 28 and if successful the trash robotics will continue over the next year.